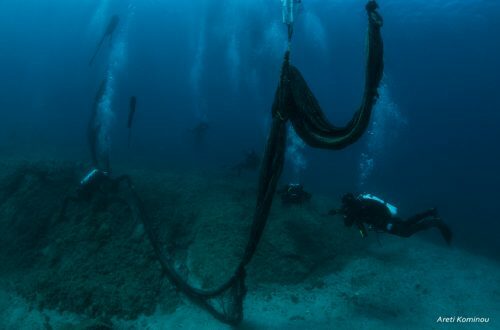 This month BLUE, in collaboration with the Healthy Seas initiative, the Aeolian Islands Preservation Fund and the Ghost Fishing Foundation, is undertaking a mission to recover fishing nets that have been left or lost at sea in the waters surrounding the Aeolian Islands, north of Sicily. Each year, 640,000 tonnes of fishing gear is discarded into the ocean. Endangered bottlenose dolphins, loggerhead turtles, sperm whales and dusky groupers have been found entangled in ‘ghost nets’ near the Aeolian Islands and in the Tyrrhenian Sea, resulting in the unnecessary suffering and death of large numbers of precious marine wildlife. Once recovered, the fishing nets will be cleaned and combined with other nylon waste materials by the project’s primary sponsor, Aquafil, before being transformed into regenerated nylon, an infinitely recyclable raw material. 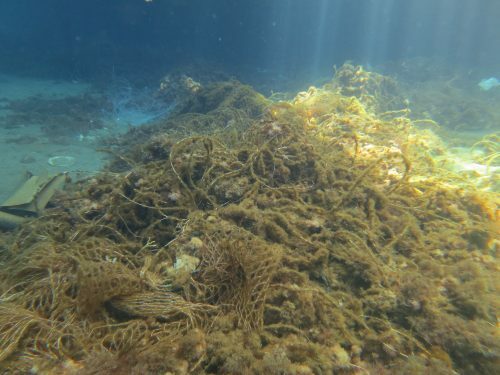 In addition to the damage caused by ghost nets, the Aeolian Islands are also under pressure from increasing tourism, irresponsible vessel mooring, overfishing and habitat degradation that threatens their natural and cultural heritage. Similarly, unregulated illegal fishing, using destructive techniques such as drift-netting and bottom dredging, removes large, predatory fish from the food chain and destroys important marine habitats. BLUE is working to solve these problems by supporting the creation of a well-managed marine protected area across the Aeolian archipelago, as well as by introducing a model of sustainable fishing whereby fishermen are rewarded for agreeing to abide by a sustainable fishing ‘code of conduct’, creating win-win for conservation and local fishermen. The ghost net removal project will directly involve local Aeolian divers and fishermen in the net recovery process. Students of the IC Lipari primary school and the IC Santa Lucia secondary school will have the opportunity to meet the divers in order to gain a first-hand understanding of the problem of marine pollution and the effect that ghost nets can have on marine Aeolian marine wildlife.